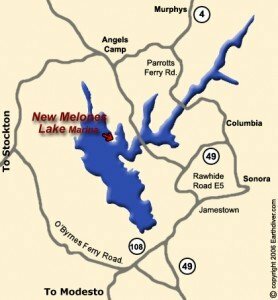 Just fifteen miles southwest of Murphys, New Melones Lake is a fantastic spot for just about any outdoor activity a person could look for — camping, hunting, boating, fishing, picnicking, hiking, biking, you name it. The lake’s two recreation areas include a total of 5 campgrounds (with over 300 campsites between them) 30 miles of hiking/biking trails, fish cleaning stations, a swim beach, and boat launch ramps with parking lots. Though winter is creeping its way in, one needn’t close the door on New Melones for the season. A year-round visitor center and museum features a variety of exhibits highlighting the area’s prehistory, the gold rush era of the “submerged town” of Melones, water management and conservation. Ranger-guided nature hikes and visitor center programs are also provided year round, and evening campground programs are provided during the summer months. New Melones Lake is noted for outstanding year-round fishing for both cold and warm water species, and outstanding boating. Nature viewers and birders will find a number of species common to the Foothill Oak Woodland, with an occasional Bald Eagle and Osprey. Hikers and mountain bikers will enjoy the numerous trails through the woodland areas.